Some colours never go out of fashion, and black is surely one of them. When it comes to timelessness, simplicity trumps complexity, and the requisite supersedes the superfluous. It is in this spirit that the Black/Black PU leather model retains the material quality and attention-to-detail of its fellow noblechairs while focusing on the essentials. Its uncompromising aesthetic is broken only by a discrete black and silver noblechairs badge, and for those of a discerning disposition who put store by the old adage "less is more", this is dedicated to you. 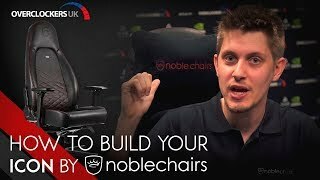 More links for "ICON Gaming Chair - Black"
Been using this for a little over a day now so early impressions but really pleased so far. Managed to humf the box upstairs and assemble myself. It's a little unwieldy to build with one person but manageable. The box is heavy and awkward though so take care. When I first sat down I wasn't that impressed. It felt hard and unyielding but after 10-15 minutes and a few adjustments, my goodness, it's a pleasure to sit on. Back/lumber support is excellent, it really is very comfortable. It is rather wide which felt a little odd at first for my frame (32 inch waist) but you soon get used to it. Very happy so far! Perfect chair, very comfortable and sturdy. Great service from Overclockers team, highly recommended. 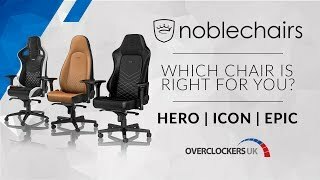 If you are looking for a high quality gaming chair that doesnt look too child like or of that from a f16 fighter jet, look no further.. Very pleased with the chair as you would hope to be after splashing out £300 on one, super sturdy no nast creaks or squeaks, a lovely bit of kit..
For those interested the wheel base measures 650mm / 65cm as this measurement is not stated in the specs. Again a top quality service from overclockers, arrived on time and packaged well. Very nice chair, although fairly expensive, I'm glad I invested in a chair of this caliber I know it will last me many years. It is very comfortable and provides very good support. Can be adjusted to accomodate diferent heights and weights which is nice. The PU leather is basically indistinguishable from real leather. If you are contemplating investing in a chair like this I would say go for it, you won't be disappointed. I have had a couple of other gaming chairs but after sitting on a Noble chair for a while at a expo it was clear this chair was a cut above the rest of them and couldn't wait to get one for myself, the Vegan leather is amazing and you could tell anyone it was real and they wouldn't question it. The chair has a lot of adjustability so you can get really comfortable and supports you really well. I couldnt't go back to any other chair now.